Professor Philippe Sands (UCL Laws) reveals that top echelons in the Bush administration put pressure on officials at Guantánamo Bay detention camp to devise new torture techniques that flout the Geneva conventions protecting prisoners' human rights, in his book 'Torture Team' published today by Allen Lane. 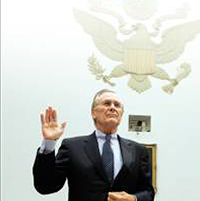 Through candid interviews with, among others, the head of interrogation and the staff judge advocate at Guantánamo, Professor Sands reveals the true circumstances in which US Secretary of Defense Donald Rumsfeld approved new and aggressive interrogation techniques in December 2002 that reneged on principles for the conduct of interrogation laid down by Abraham Lincoln almost 150 years previously. The decision involved the administration's most senior lawyers. The move was designed to extract information from a single detainee, suspected of being the 20th hijacker involved in the September 2001 attacks on the United States, who had been held in isolation for four months. However, it has led governments around the world to justify increasingly cruel methods in an effort to acquire information - methods that have proved no more effective than standard interrogation approaches, according to Professor Sands's research. Professor Sands found that the popularity of the fictional television drama '24' among the top level of the US government, which featured successful use of cruel techniques to gather intelligence, was a factor in the decision. In an interview with the 'Guardian', Professor Sands said: "Since 1863, the US military had forborne the use of cruelty in relation to any person at any time. It's a historic and marked change of direction. […] In relation to Guantánamo, decision-making went to the highest levels of the administration: the vice-president's lawyer and the president's lawyer were directly involved. […] Popular culture astonishingly played into individual decision-making on the ground at Guantánamo. The fact that the US has moved to these techniques is deeply disturbing; it has vitally undermined American moral authority and has made it much more difficult to promote the rule of law and human rights internationally." 'Torture Team: Deception, Cruelty and the Compromise of Law' will be launched officially at UCL on 2 June with a public lecture and book signing by Professor Sands organised with the UCL Student Human Rights programme. To find out more about Professor Sands's research, follow the links at the top of this article.